It’s a while since I was on my blog, let alone participate in a flash fiction challenge, but I thought I’d have a rest from my own writing today. Bert’s head surfaced from beneath the bonnet of the old pickup and he turned indignant eyes on his wife. 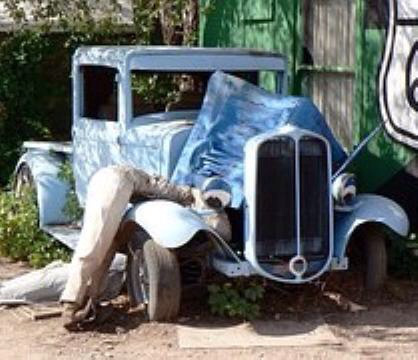 After forty years he’d hoped she’d understand his love of old cars. Really cool read! Loved the read…Filled with sarcasm and humour, more of my type of read…lovely post!!!! Btw it’s been a long time since I have seen a post from you! Really busy is it? Hope everything is fine! Great characters – you have me rooting for Bert to be able to pursue his hobby, and paint a clear picture of the unhappy wife who resents her husband spending his time and their money on something else. I know how you feel! My first book, Shadow of the Raven, was like that. I ended up bringing it to an end a lot sooner than I’d fisrt imagined, and used the 150 pages I’d lopped off as the beginning of Book 2. But I had a lot of changes to make with both the end of Book 1 and beginning of Book 2, in order to make it work. My original Book 1 was a marathon! You’ll get there in the end, Joy. It just takes tome – and patience. I’m determined to finish this story in one book and no more, but I’m surprised at how many people suggest “just” turning it into a trilogy if it’s running long. As though that would be *easier*! I’m sure you’d agree that it’s not. Good luck to both of us on our revisions! A trilogy is not easy at all, Joy, and i’ve regretted many times writing one as a first-time writer. I’m feeling so pressured right now to finish my book, simply because people are waiting for it. If I was simply writing another book – nothing to do with the other two – I wouldn’t feel the same pressure. My advice would be to keep to a one-off, first time round. You know best what you want your book to be, so stick to your guns. All will come clear as you carry on with your edits. I have a whole file of ‘deleted sections’ on my laptop – almost a book’s worth! They might come in handy, one day. Lol. I’m not sure what bfor, though. So nice seeing you write again! Breaking from the norm in writing is sometimes helpful! That sounds like a good theory! Hahaha! It may seem like a harebrained scheme now but I have a feeling it might just be quite successful! I would love to go to a museum of old cars. 🙂 Wonderful story, Millie, as always! So happy you were able to participate in the challenge this week. I have missed you! Hello again, PJ. It’s really good to be writing a piece of flash again. I really miss it! As for motor museums, there are a few I’d like to go to, so perhaps I will do, later this year. Who knows? I’m only having an odd day off my writing, unfortunately, PJ. The book I’m writing is the third one in my trilogy and I just want to get it done now. The only way I can do it is by not spending so much time on my blog. I’m looking forward to becoming a ‘regular’ blogger again later this year. Millie! Come over to my blog when you can and play the Terrible Hallmark Valentine’s Day Movie generator game and Overly Dramatic Memoir game. Hi Jacob. Thanks for visiting my post. It’s the first one I’ve written for a few weeks. I’m having a blogging break so I can get on with my book. Today, I just felt like a bit of a change. I’ll try to take a look at the game later on. Everyone needs a harebrained scheme to keep them occupied. Glad to see you popping in and good luck on the book manuscript. I’d wondered where you were. Fun, I love this story Millie! Hope your writing is going well! Thanks, Diane. It’s funny how so many of my stories are about old, married couples. I can’t think why! Lol Perhaps I should write about teenagers next time. Yes, I think you should! But not really, which of us would want to really try to relive those years? Not me – I’m more content now than I’ve ever been, and fully enjoying retirement. And if my husband fancied tinkling about with old cars I’d be quite happy. It would keep him from being under my feet while I write. Millie! It is so nice to see you pop up in my reader!!! I hope your book is going well. I really enjoyed this piece here… I can absolutely here this old married couple going back and forth about the pick up, barn, and plans for a museum. She’s probably wishing Bert had never retired! I’ve missed my blog and reading people’s posts, but my absence won’t be for ever! Thank you for visiting, Jean. It’s nice to ‘see’ you again! This one has me grinning, Millie 🙂 Great dialogue, as usual, and such a realistic scene between a married couple. I’m so glad to read that you’re busy on your novel! But… a break from the routine might refresh your spirits. Hi Ellespeth. Thanks for liking my story. I share my love for old cars with him!! Hope he finds a plan! I think you are right!! I have not really got into liking old steam engines yet! I have a 16-year-old grandson who is mad on steam engines, and he’s got everyone in the family liking them. We seem to follow the things all over the country! A fun new scheme. I hope it works out for him. But maybe he needs to think it through a bit more too. Great story. At least with a series, each book stands on its own and can even be read out of sequence. With a trilogy, the books (and storyline) follow on from each other. I have to write them so they do stand alone, but the second and third books are much richer/complete if the reader knows what happens previously. So I do feel pressured into getting the third one done asap! I’d planned to have it done by Christmas, so I’m running very late. As for flash fiction, I love doing it, and will participate again more regularly once my book is done. I’m sure you’d be great at it – but it is time consuming. Millie, I decided early on to just concentrate on blogging, writing and marketing A Berkshire Tale. With everything else around here, that’s all I can do and still stay sane. You’re very wise. I find it hard just keeping up with blogging while I write. People say Twitter is a good platform for an author, so I’ll see how it goes for a while. Millie, I’ve had little luck with Twitter and still haven’t really figured it out. I follow some followers from blogs and I retweet, but I don’t think it’s made a lot of difference. Lots of other stuff gets in and it’s really a bother to have to read through it all to find something of interest. I have lists, but seldom use them. Twitter followers are added on to the blog-follower count, I think, but I haven’t seen anybody there interested in my posts. Same with Facebook. I have to admit, I haven’t really tried to increase my following and the people who have come on to my blog have been due to other bloggers. And I really like conversations with the people I’ve come to know well. I’m afraid if I have too many followers, I could lose that due to time constraints. And you can empathize with that! Like another commenter I thought immediately of the long suffering wife of a classic car fanatic! You really have a talent for writing this quick, engaging short stories.Well done, Millie. Thank you, Amanda. The prompt gave me something I could do quickly for a ‘return’ post. It’s amazing how you get out of the blogging habit – even after only three weeks. I really enjoy writing FF and I imagine you’d be very good at it, too – if you had the time. I know you already have a full quota of weekly posts. I know what you mean about the genre you feel most comfortable with. You just need to focus on what you could write, Amanda. I’m sure you could do some kind of travel book, for a start. You have been to so many places and I bet you have lots of photos you could use to illustrate. Thank you for reading my book – and even more for liking it! I imagine it was Book 1 (Shadow of the Raven)? I’m writing Book 3 at the moment and have several people, who’ve read both books so far, waiting for it. So I desperately need to get on with it! I really wish I hadn’t started with trilogy, but it’s too late to moan now. I don’t know Millie, I have so many other projects on the go and I am busy at work. I also feel that by the time I give up work, my brain won’t be able to cope with writing so well. I look back at things I wrote when younger and think… I could never do that now! I have now added fabric design to my list of projects, and am quite excited to have sold quite a few designs already! Thanks for your encouragement, and I do hope to read the second book soon. But I will have to review the first one before that. The pleasure is mine, Millie! Not a very happy pair are they? Missed seeing you around here, but I know it’s a much needed break. You’re right. I think the lady in my story was a bit of an old grouch! I think the poor man needs a rest from her moaning. 🙂 As for my break from blogging, I’ve been intending to have one for months. It’s the only way I can do my own writing. I just get carried away on my blog, and spend hours on it! I have another 3 Quotess Challenge to do now, so I’ll do that and disappear again for a while. Believe me, I do miss my blog, and talking to lovely people liike you. I’ll be having a think about what to write in that ‘Families’ post, too. I know which aspects you’d like me to focus on. You take care, too. Ha ha! I sympathise with Bert, as I’d love to open my own knitting needle museum. Thank you for this hilarious story! I cannot believe it is true… I know a village where is a school, a church, four houses, a hurling field an a pub. We have one church, that’s all. No wonder all the young people leave! It really is very quiet (better not say ‘boring’). So nicely written, I could instantly imagine the scene, the characters, the mood, the history between them. Thanks a lot!